Our Germantown event was very successful. It was a special Memphis area day, sunny and in the low 80s. Whole Foods Market was gracious to host our event. They povided us with the entire side row for parking our electric vehicles, and the use of their 2 Level 2 chargers. EV attendance exceeded my expectations, every mass produced EV and plug in, I am aware of, was represented at our event. They included 2 Mitsubishi Mievs, 3 Chevy Volts, 1 Toyota plug in Prius, 1 Ford plug in Fusion, 2 Nissan Leafs, 1 BMW i3, 1 BMW i8, 1 Tesla Model S, and 2 hand made electric bicycles. Nissan marketing, and 1 dealerships attended, Roadshow BMW. BMW provided electric vehicles for people to check out. Mayor Mike Palazzolo attended, spoke to his desire for Germantown to explore city use of EVs and solar. He was impressed with the technology EVs. Germantown - National Drive Electric Week Event Mievs, Volts, Leafs, Teslas, BMWs, Fusions, Prius, oh my! 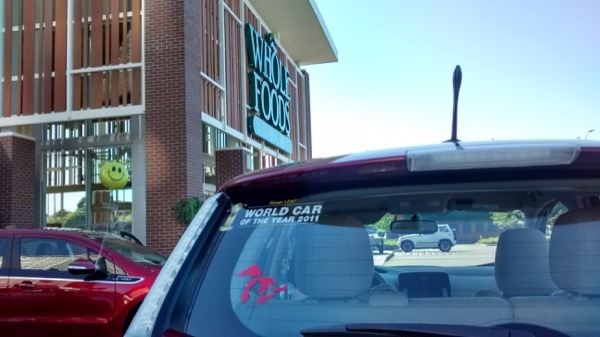 Check out our event at the new Whole Foods Market location! Charging stations are available at this location. Mayor Mike Palazzolo will be attending. There are currently 9 attendees registered. Registered attendees report 109,631 electric miles driven.